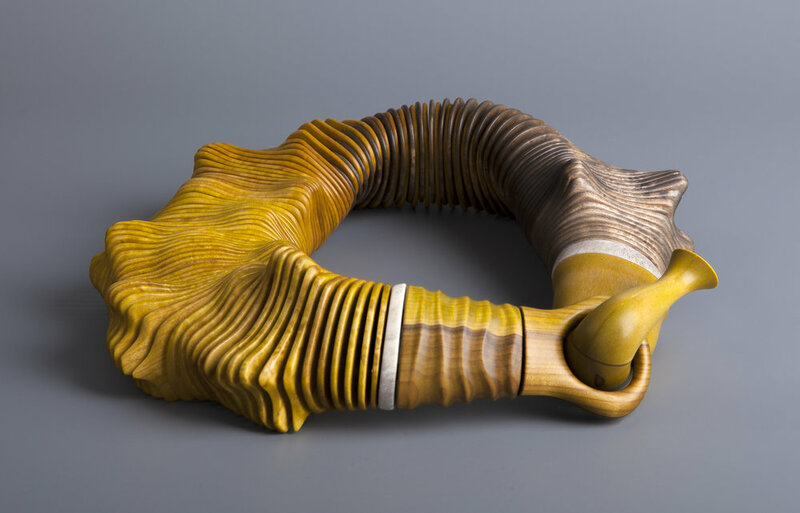 Blåvarp is particularly well known for her sculptural jewellery made of wood, a material she particularly appreciates for its tactile qualities. Her spectacular necklaces with their almost reptilian movements are brought to life like marine organisms, associating different Norwegian and exotic wood species. She sometimes incorporates ivory and whale teeth. Liv Blåvarp has also, over recent years, produced pieces for display in public space. Solo exhibitions include Kunstnerforbundet (2011, 2005), Nordens Hus, Reykjavik (2003), Sørlandets Kunstmuseum (2001), Røhsska Museet, Gothenbourg (2005). Her works are part of public collections such as Kunstindustrimuseet Oslo and Bergen, American museum of Art and Design New York, Design Museum Denmark, Newark Museum of Art New York and Montreal Museum of Decorative Art, to mention a few. She has received many prizes for her work, amongst others the Prins Eugenes Medal in 2003 and the Jacob Prize by Norsk Form in 1997.